The broadest array of commercial cash counting, sorting, recycling equipment to meet your needs. We also are the leading provider of Cash Management Solutions that can be configured for your specific requirements, adding additional efficiencies. Solutions range from simple bill acceptors to count, validate and secure your cash to high speed note and coin recyclers/dispensers for your high transaction volume environment. Fast and accurate cash counting solutions save time - Cash is counted quickly and accurately allowing your staff to spend more time serving customers and managing employees. Reduce losses - Increased accuracy when counting cash insures no miscounts and all discrepancies are detected. Retail Cash Management Solutions that eliminate errors and discrepancies and related costs as well as help your managers spend more time delighting customers and less time in the back room counting cash. Customization and options include a range of products like bill acceptors which count, validate and secure your cash to high speed note and coin recyclers/dispensers. CashTech’s high performance money counters add efficiency and reliability to any bill/currency processing environment. Make quick work of your cash counting needs with industry leading money handling equipment that fits your budget and productivity requirements. These sophisticated sorters categorize and filter bank notes while rapidly creating denomination batches for bank note bundling, ABM/ATM loading and other currency processing tasks. Sorters allow cash to be recycled within a business, bank branch or currency processing centre, reducing pick-ups and lowering processing expenses. Ideal for Casino’s, processing centres or any operation which needs to quickly, easily and accurately count strapped bundles of notes. Banks, credit unions and financial institutions have realized the importance of reducing their operating costs to handle money. By utilizing a variety of tailored Cash Dispensing and Cash Recycling solutions manufactured by GLORY, sold by CashTech, it is possible to save money, increase profitability and improve customer service. Banks, credit unions, financial institutions, casinos and now retailers are realizing the importance of reducing their operating costs to handle money. By utilizing a variety of tailored Cash and Coin Dispensing and Recycling solutions institutions and retailers are seeing labour savings, increased profitability and improved customer service. Rapid technological advances are making counterfeit bills ever more difficult to detect through traditional means. In an era of high-tech, convincing counterfeits, rely on CashTech’s counterfeit detectors for accuracy, ease-of-use and peace of mind. Save Time – Reduce time that employees spend counting coins and currency by hand with coin counters and sorters. Increase Accuracy – Coin is cumbersome and difficult to count accurately. One mistake can add up to 20 minutes when a till needs to be recounted. Simply sorting 5 to 6 denominations in itself can take several minutes and lead to a miscount. Reduce Losses - A miscount of a few nickels may not be a big deal but miscounts of loonies and toonies quickly add up to significant losses. Coin counters/sorters are quick and accurate and reduce losses. Stay Clean – Let’s face it, coin is dirty. Keep your staff clean and germ free with less handling of coin. The coin sorter is one of the many cash handling machines that offer easy and quick handling of small as well as large volumes of coin on a regular basis. Often conceived to meet both sorting and counting needs, the coin sorter is top of the line equipment that boasts increased performance, low maintenance, and ease of use. World renowned for their Coin Wrappers, Glory realizes that quick and accurate coin counting, bagging and wrapping is essential to any coin processing environment. CashTech is proud to carry Glory’s newest coin wrapping models. We offer bank authorized and approved cheque scanning equipment so you can conveniently get cheques deposited quickly and easily. Bank on your schedule and deposit cheques when it's convenient for you, 24/7. Save time and costs associated with preparing deposits and taking trips to the bank. Improve your cash flow and get faster access to your cash by depositing your cheques the same day you receive them. Review your deposit data online and know your money is securely in your account. Never worry about losing or misplacing a cheque. CashTech has multiple bank-approved scanners to fit your business’s needs. CashTech helps your business save time preparing your deposits and improve cash flow by helping you scan and securely deposit multiple cheques into your account in a single transaction from the convenience of your office. Reduce cheque-processing costs and add efficiency to your business with a cheque encoder. The Maverick high-quality cheque encoders that CashTech offers are used by financial institutions, credit unions, and businesses alike to save time, improve customer service, and enhance reporting capabilities. A cheque jogger adds value to mailrooms, offices, and remittance processing and printing operations by properly aligning mail, cheques, and documents of various sizes to help prevent jams. Make letter opening easier and much more efficient, whatever your business environment. Whether you are a small office or mailroom environment needing a desktop model or if you require high-volume programmable equipment for cutting and batching, CashTech has the solution to meet your needs and save you time. CashTech is the only truly agnostic retail cash management solution provider in Canada. It is our goal to deliver cash management solutions which will achieve the greatest return-on-investment. CashTech recommends the leading cash management solutions available in the Canadian marketplace. Whether you engage an armoured car provider or take the money to the bank yourself CashTech will provide you with the right solution. Cash Management Solutions automate your cash processes reducing labour, shrinkage and increasing cash flow. Solutions can be at the counter, in the cash room or a combination of both. All solutions have store level reporting capabilities as well as online reports accessible at head office level through a secure customer portal. Solutions are secure with individual logins and permissions. Discover how CashTech works with our clients to provide a configurable solution to automate your cash management processes and achieve the greatest return on investment. Take a few minutes to find out using this free cost of cash calculator and then let CashTech show you how to achieve a solid return-on-investment by implementing a cash management solution. Our solutions reduce manual handling of cash significantly through the use of leading edge coin and note recycling technologies from world leading vendors such as Glory. Design and print digital identification cards from your desktop to increase monitoring and security of your business, your employees and your customers. CashTech offers ID Card Printers from Datacard Group to meet your unique business needs. 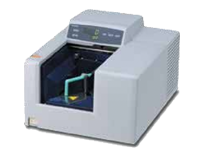 Smaller models are available for infrequent printing and larger equipment for high volume use. Small or large, ID Card Printers ensure you are in control of design and issuing of all cards. All cards can be monitored online with custom software to address your needs. ID Card Printers can also help you with your Gift Card programs and Customer Loyalty Card needs. CashTech has the solution to produce dynamic, highly personalized financial cards, gift cards and secure ID cards with superior speed and uptime so that you can produce large volume of cards if you need to. An ID printer is the ideal equipment to design and print a wealth of digital identification card solutions for any size business or industry. In addition to the card printing equipment itself, included are card printing software programs that allow you to create personalized solutions to meet your specific business requirements. Produce dynamic, highly personalized financial cards, gift cards and secure IDs with superior speed and uptime. Use a range of innovative technologies to engage cardholders and maximize security. Whether you wish to issue employee badges, membership Club Cards, student ID’s, turn to Datacard, the world’s most trusted brand in photo ID solutions. Our wide range of solutions lets you find a perfect match for your needs. Get the precise card functionality, security levels and cost-per-card you are looking for, plus proven reliability and plug and play simplicity. Compliment the efficiencies of your cash and coin handling equipment, with our quality cash handling supplies. Whether your organization is processing bills or sorting and wrapping coins we have the supply items to keep your cash room neat and processing operations accurate and well-organized. Simplify your coin processing needs with an array of high-quality coin supplies from CashTech. Whether you are counting, rolling, wrapping or boxing your coin, we have supplies to meet your needs. Prolong the life of your equipment by purchasing manufacturer approved ribbons, ink cartridges, cleaning cards and supplies for your cheque scanners and encoders. We carry only Datacard® Certified Supplies guaranteed to deliver superior card quality and optimum equipment performance. With use of the quality controlled, cost-effective cleaning products offered by CashTech, we guarantee you will increase productivity and prolong your equipment’s lifespan.